Last night I decided to try out an experiment. I absolutely LOVE glitter-bomb polish, and have always worn it by itself; not even as a top coat. But I decided to give Konading over such a polish a try, and I am fairly pleased with the results. 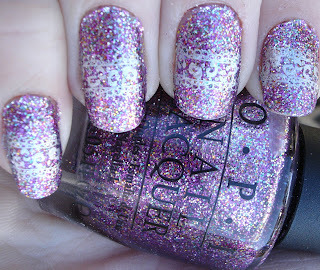 This is three coats of OPI Show It and Glow It!, a gorgeous chunky glitter polish from their Burlesque line. It is completely gorgeous, with the main colors being medium pink, blue and silver same-sized glitter. It gives off a really great sparkle. Be prepared to stare at your nails with this one! Application was very nice, like most good glitters. Dry time was great and there was minimal bumpiness to the finish - two coats of Seche Vite totally smoothed out any rough feeling. Zoomed-in view of the glitter! As for my Konad experimentation, I used my favorite silver stamper Nicole by OPI Positive Energy and Konad plate m57. While I wasn't sure originally if I was going to like the look of stamping over such a colorful glitter polish, I have decided I really like the effect. 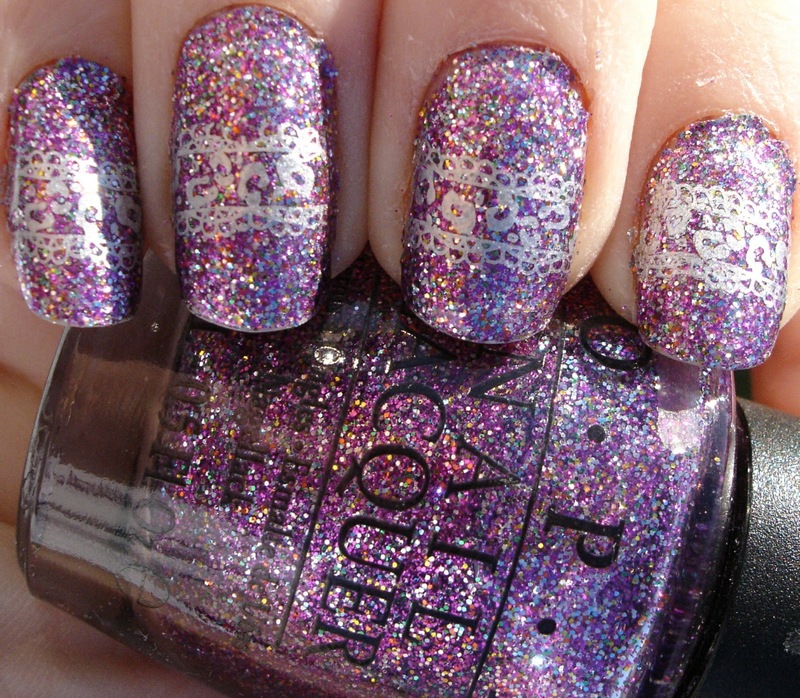 What do you think - Konading over a glitter-bomb polish a yes or no? Have you ever tried it? I love this glitter polish but could barely find your konad design! Skip all the hassle and wear this glitter baby! its so fierce by itself! I've never tried konading over a glitter like this but I think I will soon. It seems weird to use a word like subtle to describe this look, but the konad really is subtle but really very pretty. wow, this is a beautiful color! oh wow love it very nice!!! I like it! I've done the konad over a glitter bomb look a few times, and I think it works best when you use a contrasting color and a design that covers a good amount of nail. I feel like the smaller designs tend to get lost in the glitteriness. Michelle - I seriously almost used the description "subtle" in this post, but I thought it sounded weird too, haha. Glad you agree. Brooke - Thanks! It is a really great polish. ChaosButterfly - The design does get a bit lost, but like mentioned before, it makes the design a bit more subtle. I will have to try a highly contrasting color in a full pattern next time I try this! Thanks for the recommendation. I really love the last one! I love glitter. I'm having a giveaway over at http://oxsweetcheeksxo.blogspot.com/2010/11/mac-makeup-dupes.html sorry if I spammed your page but I want to put the giveaway out there i had it before and only 2 people enterd so closed it.